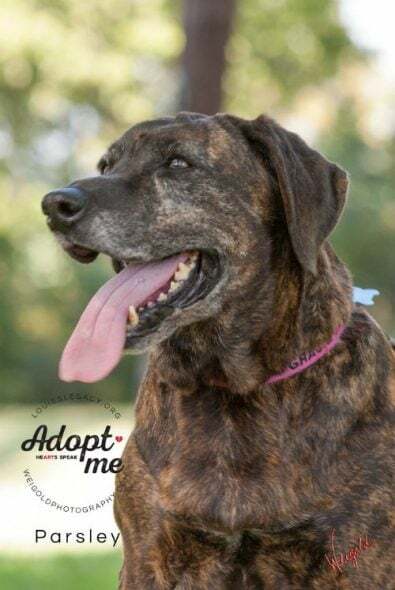 ADOPTABLE: Parsley is a big bundle of brindle with a beautiful smile! Parsley is a sweet senior who gets along well with other dogs. She’s in the NYC area and ready for her forever family! Parsley is easygoing and cuddly, say folks at Louie’s Legacy Animal Rescue. But she loves to play with her foster siblings, too! Ready for a sweet complement, a versatile flavor to suit any lifestyle? 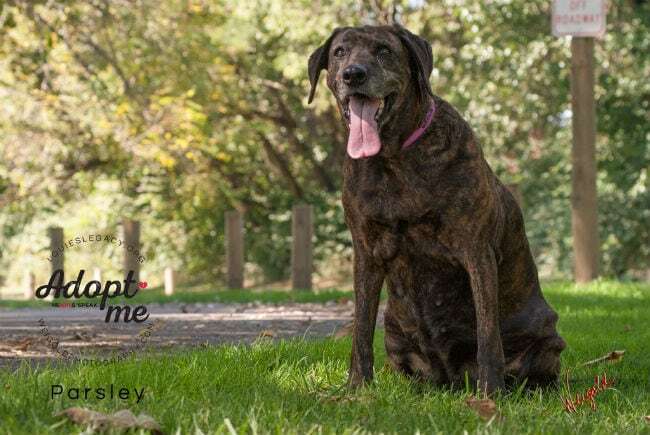 Meet Parsley, the perfectly precious Plott hound! A young-at-heart senior at 8 years old, she’s easygoing, but always up for a walk or a break in the yard. Like many of us, Parsley is working on getting some extra weight off of her frame, which will help keep her more mobile as she ages. But, darn it, she loves to eat! The good news? Now that she has completed the necessary kennel rest following her heartworm treatment, she is able to get out for exercise and long walks. Parsley loves hanging with her foster brothers and sisters but is always looking to sneak a bit of their kibbles or treats! She needs frequent potty breaks throughout the day, but is otherwise house-trained. She loves her big soft bed, and also loves to settle in next to you for an evening of relaxation. And when she looks at you with her big dark eyes, your heart will melt! 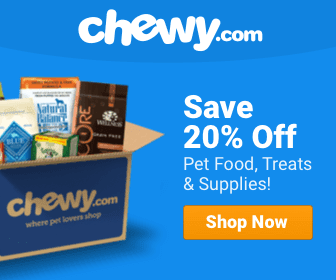 Louie’s Legacy Animal Rescue is one of the largest 501(c)(3) foster-based rescue organizations in the US, primarily serving the Midwest and Northeast, with bases of operations in Ohio, New York, and Connecticut. Louie’s is looking to save more senior dogs than ever in the coming year as a first-time Grey Muzzle Organization grantee. Parsley is located in the New York City area. For more information about her, visit the Louie’s Legacy website. Just add water! A giggle-worthy compilation of swimming, splashing dogs.